In 1996, the NSA published a paper entitled How to Make a Mint: the Cryptography of Anonymous Electronic Cash, describing a Cryptocurrency system first publishing it in a MIT mailing list and later in 1997, in The American Law Review (Vol. 46, Issue 4). On 6 August 2014, the UK announced its Treasury had been commissioned to do a study of cryptocurrencies, and what role, if any, they can play in the UK economy. The study was also to report on whether regulation should be considered. The system does not require a central authority, its state is maintained through distributed consensus. In March 2018, the word cryptocurrency was added to the Merriam-Webster Dictionary. A blockchain account can provide functions other than making payments, for example in decentralized applications or smart contracts. In this case, the units or coins are sometimes referred to as crypto tokens (or cryptotokens). As of May 2018[update], over 1,800 cryptocurrency specifications existed. 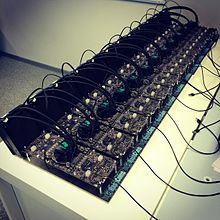 Within a cryptocurrency system, the safety, integrity and balance of ledgers is maintained by a community of mutually distrustful parties referred to as miners: who use their computers to help validate and timestamp transactions, adding them to the ledger in accordance with a particular timestamping scheme. Cryptocurrencies use various timestamping schemes to "prove" the validity of transactions added to the blockchain ledger without the need for a trusted third party. The first timestamping scheme invented was the proof-of-work scheme. The most widely used proof-of-work schemes are based on SHA-256 and scrypt. As of February 2018[update], the Chinese Government halted trading of virtual currency, banned initial coin offerings and shut down mining. Some Chinese miners have since relocated to Canada. One company is operating data centers for mining operations at Canadian oil and gas field sites, due to low gas prices. In June 2018, Hydro Quebec proposed to the provincial government to allocate 500 MW to crypto companies for mining. According to a February 2018 report from Fortune, Iceland has become a haven for cryptocurrency miners in part because of its cheap electricity. Prices are contained because nearly all of the country's energy comes from renewable sources, prompting more mining companies to consider opening operations in Iceland. The region's energy company says bitcoin mining is becoming so popular that the country will likely use more electricity to mine coins than power homes in 2018. In October 2018 Russia was to become home to one of the largest legal mining operations in the world, located in Siberia. In March 2018, a town in Upstate New York put an 18-month moratorium on all cryptocurrency mining in an effort to preserve natural resources and the "character and direction" of the city. An increase in cryptocurrency mining increased the demand of graphics cards (GPU) in 2017. Popular favorites of cryptocurrency miners such as Nvidia's GTX 1060 and GTX 1070 graphics cards, as well as AMD's RX 570 and RX 580 GPUs, doubled or tripled in price – or were out of stock. A GTX 1070 Ti which was released at a price of $450 sold for as much as $1100. Another popular card GTX 1060's 6 GB model was released at an MSRP of $250, sold for almost $500. RX 570 and RX 580 cards from AMD were out of stock for almost a year. Miners regularly buy up the entire stock of new GPU's as soon as they are available. Nvidia has asked retailers to do what they can when it comes to selling GPUs to gamers instead of miners. "Gamers come first for Nvidia," said Boris Böhles, PR manager for Nvidia in the German region. Additions such as Zerocoin, Zerocash and CryptoNote have been suggested, which would allow for additional anonymity and fungibility. Most cryptocurrency tokens are fungible and interchangeable. However, unique non-fungible tokens also exist. Such tokens can serve as assets in games like CryptoKitties. Cryptocurrencies are used primarily outside existing banking and governmental institutions and are exchanged over the Internet. For ether, transaction fees differ by computational complexity, bandwidth use, and storage needs, while bitcoin transaction fees differ by transaction size and whether the transaction uses SegWit. In September 2018, the median transaction fee for ether corresponded to $0.017, while for bitcoin it corresponded to $0.55. Cryptocurrency exchanges allow customers to trade cryptocurrencies for other assets, such as conventional fiat money, or to trade between different digital currencies. Atomic swaps are a mechanism where one cryptocurrency can be exchanged directly for another cryptocurrency, without the need for a trusted third party such as an exchange. 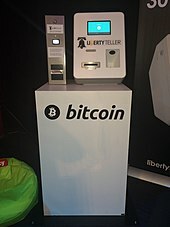 Jordan Kelley, founder of Robocoin, launched the first bitcoin ATM in the United States on 20 February 2014. The kiosk installed in Austin, Texas is similar to bank ATMs but has scanners to read government-issued identification such as a driver's license or a passport to confirm users' identities. According to PricewaterhouseCoopers, four of the 10 biggest proposed initial coin offerings have used Switzerland as a base, where they are frequently registered as non-profit foundations. The Swiss regulatory agency FINMA stated that it would take a "balanced approach" to ICO projects and would allow "legitimate innovators to navigate the regulatory landscape and so launch their projects in a way consistent with national laws protecting investors and the integrity of the financial system." In response to numerous requests by industry representatives, a legislative ICO working group began to issue legal guidelines in 2018, which are intended to remove uncertainty from cryptocurrency offerings and to establish sustainable business practices. Various government agencies, departments, and courts have classified bitcoin differently. China Central Bank banned the handling of bitcoins by financial institutions in China in early 2014. In Russia, though cryptocurrencies are legal, it is illegal to actually purchase goods with any currency other than the Russian ruble. Regulations and bans that apply to bitcoin probably extend to similar cryptocurrency systems. In August 2018, the Bank of Thailand announced its plans to create its own cryptocurrency, the Central Bank Digital Currency (CBDC). Bitcoin and other cryptocurrency advertisements were temporarily banned on Facebook, Google, Twitter, Bing, Snapchat, LinkedIn and MailChimp. Chinese internet platforms Baidu, Tencent, and Weibo have also prohibited bitcoin advertisements. The Japanese platform Line and the Russian platform Yandex have similar prohibitions. Cryptocurrency networks display a lack of regulation that has been criticized as enabling criminals who seek to evade taxes and launder money. The French regulator Autorité des marchés financiers (AMF) lists 15 websites of companies that solicit investment in cryptocurrency without being authorised to do so in France. Properties of cryptocurrencies gave them popularity in applications such as a safe haven in banking crises and means of payment, which also led to the cryptocurrency use in controversial settings in the form of online black markets, such as Silk Road. The original Silk Road was shut down in October 2013 and there have been two more versions in use since then. In the year following the initial shutdown of Silk Road, the number of prominent dark markets increased from four to twelve, while the amount of drug listings increased from 18,000 to 32,000. In September 2015, the establishment of the peer-reviewed academic journal Ledger (ISSN 2379-5980) was announced. It covers studies of cryptocurrencies and related technologies, and is published by the University of Pittsburgh. ^ a b Andy Greenberg (20 April 2011). "Crypto Currency". Forbes.com. Archived from the original on 31 August 2014. Retrieved 8 August 2014. ^ Cryptocurrencies: A Brief Thematic Review Archived 25 December 2017 at the Wayback Machine. Economics of Networks Journal. Social Science Research Network (SSRN). Date accessed 28 August 2017. ^ Schueffel, Patrick (2017). The Concise Fintech Compendium. Fribourg: School of Management Fribourg/Switzerland. Archived from the original on 24 October 2017. ^ Allison, Ian (8 September 2015). "If Banks Want Benefits of Blockchains, They Must Go Permissionless". International Business Times. Archived from the original on 12 September 2015. Retrieved 15 September 2015. ^ Matteo D'Agnolo. "All you need to know about Bitcoin". timesofindia-economictimes. Archived from the original on 26 October 2015. ^ Sagona-Stophel, Katherine. "Bitcoin 101 white paper" (PDF). Thomson Reuters. Archived from the original (PDF) on 13 August 2016. Retrieved 11 July 2016. ^ Pitta, Julie. "Requiem for a Bright Idea". Archived from the original on 30 August 2017. Retrieved 11 January 2018. ^ "How To Make A Mint: The Cryptography of Anonymous Electronic Cash". groups.csail.mit.edu. Archived from the original on 26 October 2017. Retrieved 11 January 2018. ^ Laurie, Law; Susan, Sabett; Jerry, Solinas (11 January 1997). "How to Make a Mint: The Cryptography of Anonymous Electronic Cash". American University Law Review. 46 (4). Archived from the original on 12 January 2018. Retrieved 11 January 2018. ^ Wei Dai (1998). "B-Money". Archived from the original on 4 October 2011. ^ a b Jerry Brito and Andrea Castillo (2013). "Bitcoin: A Primer for Policymakers" (PDF). Mercatus Center. George Mason University. Archived (PDF) from the original on 21 September 2013. Retrieved 22 October 2013. ^ "UK launches initiative to explore potential of virtual currencies". The UK News. Archived from the original on 10 November 2014. Retrieved 8 August 2014. ^ Lansky, Jan (January 2018). "Possible State Approaches to Cryptocurrencies". Journal of Systems Integration. 9/1: 19–31. doi:10.20470/jsi.v9i1.335. ^ "The Dictionary Just Got a Whole Lot Bigger". Merriam-Webster. March 2018. Retrieved 5 March 2018. ^ Yang, Stephanie (31 January 2018). "Want to Keep Up With Bitcoin Enthusiasts? Learn the Lingo". WSJ. Retrieved 8 June 2018. ^ Vigna, Paul (19 December 2017). "Which Digital Currency Will Be the Next Bitcoin?". WSJ. Retrieved 8 June 2018. ^ Hankin, Aaron (4 June 2018). "Bitcoin begins the week with a stumble; SEC announces adviser for digital assets". MarketWatch. Retrieved 6 June 2018. ^ a b Economist Staff (31 October 2015). "Blockchains: The great chain of being sure about things". The Economist. Archived from the original on 3 July 2016. Retrieved 18 June 2016. ^ Badkar, Mamta (14 May 2018). "Fed's Bullard: Cryptocurrencies creating 'non-uniform' currency in US". Financial Times. Retrieved 14 May 2018. ^ "Blockchain". Investopedia. Archived from the original on 23 March 2016. Retrieved 19 March 2016. Based on the Bitcoin protocol, the blockchain database is shared by all nodes participating in a system. ^ Raval, Siraj (2016). "What Is a Decentralized Application?". Decentralized Applications: Harnessing Bitcoin's Blockchain Technology. O'Reilly Media, Inc. pp. 1–2. ISBN 978-1-4919-2452-5. OCLC 968277125. Retrieved 6 November 2016 – via Google Books. ^ a b c Krishnan, Hari; Saketh, Sai; Tej, Venkata (2015). "Cryptocurrency Mining – Transition to Cloud". International Journal of Advanced Computer Science and Applications. 6 (9). doi:10.14569/IJACSA.2015.060915. ISSN 2156-5570. ^ Hern, Alex (17 January 2018). "Bitcoin's energy usage is huge – we can't afford to ignore it". The Guardian. Archived from the original on 23 January 2018. Retrieved 23 January 2018. ^ "China's Crypto Crackdown Sends Miners Scurrying to Chilly Canada". 2 February 2018 – via www.bloomberg.com. ^ "Cryptocurrency mining operation launched by Iron Bridge Resources". World Oil. 26 January 2018. Archived from the original on 30 January 2018. ^ "Bitcoin and crypto currencies trending up today - Crypto Currency Daily Roundup June 25 - Market Exclusive". marketexclusive.com. Retrieved 27 June 2018. ^ "Iceland Expects to Use More Electricity Mining Bitcoin Than Powering Homes This Year". Fortune. Retrieved 25 March 2018. ^ "Bitcoin Mining Banned for First Time in Upstate New York Town". 16 March 2018 – via www.bloomberg.com. ^ "Bitcoin mania is hurting PC gamers by pushing up GPU prices". Archived from the original on 2 February 2018. Retrieved 2 February 2018. ^ "Graphics card shortage leads retailers to take unusual measures". Archived from the original on 2 February 2018. Retrieved 2 February 2018. ^ "AMD, Nvidia must do more to stop cryptominers from causing PC gaming card shortages, price gouging". Archived from the original on 2 February 2018. Retrieved 2 February 2018. ^ "Nvidia suggests retailers put gamers over cryptocurrency miners in graphics card craze". Archived from the original on 2 February 2018. Retrieved 2 February 2018. ^ Lee, Justina (13 September 2018). "Mystery of the $2 Billion Bitcoin Whale That Fueled a Selloff". Bloomberg. ^ "What You Need To Know About Zero Knowledge". TechCrunch. Retrieved 19 December 2018. ^ Greenberg, Andy (25 January 2017). "Monero, the Drug Dealer's Cryptocurrency of Choice, Is on Fire". Wired. ISSN 1059-1028. Retrieved 19 December 2018. ^ Commission, Ontario Securities. "CSA Staff Notice 46-307 Cryptocurrency Offerings". Ontario Securities Commission. Archived from the original on 29 September 2017. Retrieved 20 January 2018. ^ "SEC Issues Investigative Report Concluding DAO Tokens, a Digital Asset, Were Securities". www.sec.gov. Archived from the original on 10 October 2017. Retrieved 20 January 2018. ^ "Company Halts ICO After SEC Raises Registration Concerns". www.sec.gov. Archived from the original on 19 January 2018. Retrieved 20 January 2018. ^ R Atkins (Feb. 2018). Switzerland sets out guidelines to support initial coin offerings. Financial Times. Retrieved 26 May 2018. ^ Kharpal, Arjun (12 April 2017). "Bitcoin value rises over $1 billion as Japan, Russia move to legitimize cryptocurrency". CNBC. Retrieved 19 March 2018. ^ "Regulation of Cryptocurrency Around the World" (PDF). Library of Congress. The Law Library of Congress, Global Legal Research Center. June 2018. pp. 4–5. Retrieved 15 August 2018. ^ Fung, Brian (21 May 2018). "State regulators unveil nationwide crackdown on suspicious cryptocurrency investment schemes". Washington Post. Archived from the original on 27 May 2018. Retrieved 27 May 2018. ^ Samburaj Das (May 2018)Iran and Russia Consider Using Cryptocurrency to Evade US Sanctions: ReportCCN-Altcoin News. Retrieved 23 May 2018. ^ Thompson, Luke (24 August 2018). "Bank of Thailand to launch its own crypto-currency". Asia Times. Retrieved 27 August 2018. ^ Matsakis, Louise (30 January 2018). "Cryptocurrency scams are just straight-up trolling at this point". Wired. Archived from the original on 1 April 2018. Retrieved 2 April 2018. ^ Weinglass, Simona (28 March 2018). "European Union bans binary options, strictly regulates CFDs". Times of Israel. Archived from the original on 1 April 2018. Retrieved 2 April 2018. ^ Alsoszatai-Petheo, Melissa (14 May 2018). "Bing Ads to disallow cryptocurrency advertising". Microsoft. Archived from the original on 17 May 2018. Retrieved 16 May 2018. ^ French, Jordan (2 April 2018). "3 Key Factors Behind Bitcoin's Current Slide". theStreet.com. Archived from the original on 3 April 2018. Retrieved 2 April 2018. ^ Wilson, Thomas (28 March 2018). "Twitter and LinkedIn ban cryptocurrency adverts – leaving regulators behind". Independent. Reuters. Archived from the original on 4 April 2018. Retrieved 3 April 2018. ^ Rushe, Dominic (25 March 2014). "Bitcoin to be treated as property instead of currency by IRS". The Guardian. Archived from the original on 1 June 2016. Retrieved 8 February 2018. ^ Iwamura, Mitsuru; Kitamura, Yukinobu; Matsumoto, Tsutomu (28 February 2014). "Is Bitcoin the Only Cryptocurrency in the Town? Economics of Cryptocurrency and Friedrich A. Hayek". doi:10.2139/ssrn.2405790. hdl:10086/26493. SSRN 2405790. ^ a b Sarah Jeong, DEA Agent Who Faked a Murder and Took Bitcoins from Silk Road Explains Himself Archived 29 December 2017 at the Wayback Machine, Motherboard, Vice (25 October 2015). ^ Nate Raymond, Ex-agent in Silk Road probe gets more prison time for bitcoin theft Archived 29 December 2017 at the Wayback Machine, Reuters (7 November 2017). ^ Cyris Farivar, GAW Miners founder owes nearly $10 million to SEC over Bitcoin fraud Archived 29 December 2017 at the Wayback Machine, Ars Technica (5 October 2017). ^ Russell, Jon. "Tether, a startup that works with bitcoin exchanges, claims a hacker stole $31M". TechCrunch. Archived from the original on 21 November 2017. Retrieved 22 November 2017. ^ "Bitcoin Gold Hit by Double Spend Attack, Exchanges Lose Millions". CCN. 23 May 2018. Retrieved 24 May 2018. ^ Roberts, Jeff John (9 July 2018). "Another Crypto Fail: Hackers Steal $23.5 Million from Token Service Bancor". Fortune. Retrieved 10 July 2018. ^ "News releases AMF: 2018". The Autorité des marchés financiers (AMF). 15 March 2018. Retrieved 10 May 2018. ^ Raeesi, Reza (23 April 2015). "The Silk Road, Bitcoins and the Global Prohibition Regime on the International Trade in Illicit Drugs: Can this Storm Be Weathered?". Glendon Journal of International Studies / Revue d'Études Internationales de Glendon. 8 (1–2). ISSN 2291-3920. Archived from the original on 22 December 2015. ^ Polgar, David. "Cryptocurrency is a giant multi-level marketing scheme". QZ.com. Quartz Media LLC. Retrieved 2 March 2018. ^ Analysis of Cryptocurrency Bubbles Archived 24 January 2018 at the Wayback Machine. Bitcoins and Bank Runs: Analysis of Market Imperfections and Investor Hysterics. Social Science Research Network (SSRN). Accessed 24 December 2017. ^ Schwartzkopff, Frances (17 December 2013). "Bitcoins Spark Regulatory Crackdown as Denmark Drafts Rules". Bloomberg. Archived from the original on 29 December 2013. Retrieved 29 December 2013. ^ Sidel, Robin (22 December 2013). "Banks Mostly Avoid Providing Bitcoin Services. Lenders Don't Share Investors' Enthusiasm for the Virtual-Currency Craze". Online.wsj.com. Archived from the original on 19 November 2015. Retrieved 29 December 2013. ^ "Scamcoins". August 2013. Archived from the original on 1 February 2014. ^ Bradbury, Danny (25 June 2013). "Bitcoin's successors: from Litecoin to Freicoin and onwards". The Guardian. Guardian News and Media Limited. Archived from the original on 10 January 2014. Retrieved 11 January 2014. ^ Morris, David Z (24 December 2013). "Beyond bitcoin: Inside the cryptocurrency ecosystem". Fortune. Archived from the original on 27 January 2018. Retrieved 27 January 2018. ^ "PAUL KRUGMAN: Bitcoin is a more obvious bubble than housing was". ^ Krugman, Paul (26 March 2018). "Opinion - Bubble, Bubble, Fraud and Trouble" – via NYTimes.com. ^ "Warren Buffett: Cryptocurrency will come to a bad ending". CNBC. ^ Imbert, Fred (13 October 2017). "BlackRock CEO Larry Fink calls bitcoin an 'index of money laundering'". Archived from the original on 30 October 2017. Retrieved 19 November 2017. ^ "Introducing Ledger, the First Bitcoin-Only Academic Journal". Motherboard. Archived from the original on 10 January 2017. ^ "Editorial Policies". ledgerjournal.org. Archived from the original on 23 December 2016. ^ "How to Write and Format an Article for Ledger" (PDF). Ledger. 2015. doi:10.5195/LEDGER.2015.1 (inactive 10 February 2019). Archived (PDF) from the original on 22 September 2015.